A guest blog post from the president of George Sutton Toastmasters, Marty Dickinson. The first professional speaker I met joined my Toastmasters club in 1997 after I had been a member at George Sutton Toastmasters for two years. 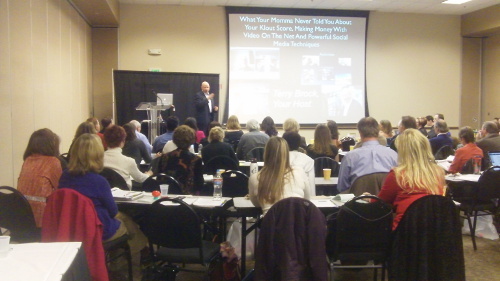 At first, I couldn’t understand why a “professional speaker,” with experience presenting to audiences of hundreds of people (…and getting paid for it!! ), would want to waste his time with 5-7 minute speeches and hanging around people like me who still got nervous getting called up to deliver 1-2 minute impromptu responses during Table Topics. One of my favorite associations to be affiliated with, as a speaker myself, is the Colorado chapter of National Speakers Association (NSAColorado.org). I’m very good friends with several of the top speakers in their industries. Now, granted, there are many very talented speakers in NSA like one of my favorites shown here, Terry Brock. But, I’m going to hold my hat out there and suggest that not 25%, not 50%, not even 90%….no, 100% of ALL professional speakers would become more skilled presenters by being an active member in a quality Toastmasters club. The obvious result would be commanding more money for their speaking gigs, requiring less preparation time, and higher percentage of being asked back to speak to the same audience. Speak Every Week – One of my great friends in the speaking business, Joe Sabah, says “Speakers SPEAK!” If you’re going to hold yourself out there as a “professional speaker,” you can’t be holed up in your home office waiting for the phone to ring. Seize every opportunity to get in front of people. Toastmasters gives you a rare opportunity to get in front of an audience every week. Some weeks, you might only stand up and offer a “thought of the day” or be the “timer.” Even if you are assigned lower-level duties for a week, you are still guaranteed to be in front of an audience at every meeting. Consistency of being in front of people and staying “in speaking shape” is a large component of becoming a successful professional speaker and Toastmasters can help in a big way. Return to Basics – Professional speakers tend to get caught up in whatever the hot technique or gadget is in the speaking world. If you don’t have a MAC and incorporate videos in your presentations, for example, or if you don’t have a Flash Mob somewhere in your keynote, you’re just not a “hip” presenter, some feel. Toastmasters allows a speaker to get away from keeping-up-with-the-expectations of other professional speakers. It allows you to return to the basics of speech communication and delivery in the comfort of a group that will allow you to experiment and screw up…and you’re still invited back the very next week. Explore Topics and Approaches – The place to experiment with new material is NOT once you’ve been contracted financially to present to an audience of 1,000 people. Toastmasters offers a forum for you to try new things and new delivery methods and see how a forgiving and supportive group responds. Getting immediate feedback and positive critique and suggestions for improvement is the Toastmasters staple that creates rising stars. Get Humble – If you visit a quality Toastmasters club, you will be simply amazed at the high quality of the non-professional speakers within the membership. Too many professional speakers I know think they are better speakers than they really are. Being humbled by amateur speakers offers an opportunity for growth to new levels of competence that are hard to describe here in a blog post. Get Evaluated – My favorite part of every Toastmasters meeting is the evaluation section where members are scheduled in advance to evaluate a speaker’s presentation. Of course, it’s easy to see the benefit where you might be evaluated by a speaker with more experience than you have. But, the hidden benefit is being evaluated from members with LESS speaking skill than you possess. How can this be true you ask? It’s one of the big hang-ups that professional speakers in my network struggle with, so I’d like to explain it fully for you. When you speak at one of your paid speaking gigs to an audience of, let’s say 100 people, every person in that room is going to be secretly evaluating your every word, every gesture, every story, every attempt at humor, every nuance. How do you know if you’ve done a good job in your presentation? By the number of back-of-the-room sales you’ve made? Maybe in part. By the pats on the back you get from the four or five that approach you at the front of the room after your talk? Possibly. The real answer as to know if you did a good job or not…is if you get asked back to present to the group sometime in the future. The audience will often fill out evaluation forms of your presentation. You may or may not see the evaluations. But, it is VITAL to your future as a professional speaker that you know how your audience will react to your content. And, not everyone in that audience is going to be a seasoned and skilled speaker. Does that make sense? I’m suggesting that there is GREAT value in having your presentation evaluated in a Toastmasters setting by a speaker with LESS experience and LESS speaking skill than you have. Embrace this concept and you will have climbed over a big hurdle that prevents professional speakers from joining Toastmasters…and you will be on your way to satisfying a larger percentage of your audiences in your paid speaking gigs. Improve Your Speaking by Evaluating Others – When you become scheduled to evaluate other newb or advanced members of your club, you will become a better speaker as a result. Napoleon Hill was the first to suggest to me in his writing that “no one ever learned anything by doing all the talking.” He meant that you learn much more by listening. When you evaluate a speaker in Toastmasters, you have to pay attention to every detail for the duration of the speakers presentation. Your role is to read the speaker’s objectives for the presentation in the Toastmasters manual, offer some kudos and then provide some ways the speech could be improved. You only have a few minutes to prepare this little 2-3 minute speech to formally evaluate the speaker from the front of the room. Trust me when I say that providing a quality evaluation is THE most challenging part of the Toastmasters program. You will become a better speaker by evaluating other members. Personal Reward in Assisting Other Members – There’s no better feeling than mentoring a new member and watching that person’s speaking progress excel exponentially as they progress through the Toastmasters program. I don’t need a few paragraphs to describe that one. You get it. Learn from Other Professional Speaker Members – You might be surprised to find you’re not the only “professionl speaker” in the club and you can always learn from other pro speakers in the business. Face Your Own Challenges – Even if you’ve been speaking professionally for 10 years, I’ll be you can think of a few challenges you have. They could be content related, physical, technical, emotional. We all have them. Toastmasters offers that one place you can go to exercise your demons and get past what’s been holding you back from catapulting into the next level of professional speaking. Work Your Keynote – Toastmasters is a great place to take a small piece of a longer keynote presentation and practice it and refine it. Dissect your entire presentation over time and present them in 5-7 minute increments to the club as part of your scheduled speaking opportunities. Go Overboard – Dramatize your speeches in ways that might be considered overboard on a professional stage. Going a bit overboard sometimes is a great way to push the limits and discover new boundaries…and new opportunities. It’s quite possible that your outside-the-box presentation could be seen as uniquely entertaining! Who knows, you might stumble across some new material in Toastmasters that you wind up adding to your professional speech. Eliminate Annoying Habits – I consider this benefit to be different than confronting challenges because habits are often little quirky annoyances that you might not even be aware of as a speaker. But, they can definitely be the source of poor evaluations made by audiences participants. Let Toastmasters members point out your annoying habits and don’t get offended by them. Embrace them! You’ll become a better speaker and a more sought after speaker as a result.ample. Inspire Talent When You See it – If you’re a professional speaker, chances are good that you associate with other professional speakers and you’ve probably seen many high quality speakers present as well. When you see someone that just “has it” in your club, take them aside and let them know. Invite them to your local NSA chapter meeting. Get them introduced to some speakers you know. If they have a desire to become a professional speaker, assist in any way you can. Having the opportunity to support and inspire new speakers is one of the greatest benefits a professional speaker can enjoy as a member in Toastmasters. Gain Meeting Facilitation Experience – Most speakers speak. Few speakers get to lead the event. Every few months, you will be scheduled to serve as “The Toastmaster” for a meeting. That’ means you are responsible for preparing for the meeting and serving as Master of Ceremonies for the meeting duration. Not only will you gain a new skill as an M.C., but you will also understand more about how challenging it must be to be a meeting planner in charge of a large event where you might be speaking. You will become a better speaker by leading Toastmasters meetings as The Toastmasters of the Day. Discover New Presentation Outlets – Once you’ve been a member for a while, you will be introduced to outside-the-club opportunities. You might be called on to be a guest speaker for another Toastmasters club or as The Toastmaster of the Day for an area, division or district contest. Members of your own club might have very interesting network ties that could bring you speaking opportunities. You just never know who might be in your Toastmasters audience. Practice Your Improvisation Skills – Every Toastmasters meeting has a component called Table Topics where various members are called on to respond to a topic for 1-2 minutes. Doesn’t seem like much of a challenge for a pro speaker right? We’ll see! Learn From Others – Too many professional speakers think they can’t learn from others unless they’re learning from other, more established, professional speakers. Give Toastmasters a week or two and you will have a much different outlook on this opinion! There are many skilled Toastmasters members in every club that have better presentation skills than the majority of paid speakers out there. Learn From the Toastmasters Process – Even if you’ve been a professional speaker for a number of years, I’m betting you will find some objectives in the Toastmasters manuals to be challenging for you. For example, I remember one speech in one of the 15 advanced Toastmasters manual where I could pick any topic, but my objective was to read my speech aloud to the club. At the time, that was something I had never done before. I never realized there was so much technique to reading a speech to an audience. One day that experience came in handy when I was delivering one of my usual 4-hour paid workshops and I wanted to read something to the audience. I drew upon that experience in Toastmasters and applied the suggestions written in the Toastmasters manual. See how that works? Inspire Visitors to Join – You can use your stories and experience as a professional speaker to inspire visitors to join. There is great reward in contributing to changing peoples’ lives! Perfect Your Paid Speech – One of our members recently competed in our club speech contest with a 5-7 minute speech. He then competed at the Area contest. Before the Area contest, he delivered the same speech again to our club. Then presented the same speech for even more practice at another club. After he competed at the Area contest, he was asked to present his first “paid” speaking gig…a 45 minute presentation. His 5-7 minute contest speech was part of his 45-minute paid speaking gig speech. And, he rocked it! Toastmasters gives you the opportunity to practice a speech, change it, and do it again until it’s right. When you’re on stage and getting paid to speak, you only get one chance. Get it right at Toastmasters and then bring it to the stage. Record Your Speeches – You don’t have to hire a professional videographer. Just give your video camera to a member and you’ll get your speech recorded so you can watch it later and evaluate your own performance. Or, step it up a notch and deliver a 10-minute speech and hire a pro to record your 10-minute uncut demo for your website. Reorganize Your Paid Speech – By presenting components of your paid speech in smaller doses to your Toastmasters club, you might discover why your audiences haven’t been really “getting” your material. Don’t worry, your Toastmasters club members will spot the flaws in the organization of your speech and give you suggestions for improvement. Support Others Struggling with Fear – About half of all Toastmasters members join a club to simply conquer their fear of speaking in front of a group. By supporting others with their challenges, they will support you in return. Learn to Enjoy Speaking Again – I think this was my most powerful motivator for re-joining Toastmasters this year. I just got a bit bored of only speaking within my industry profession. Participating in Toastmasters every week provides the opportunity to speak every week and have fun too. And, that’s what speaking should be…fun! So, there you have it. 30 ways professional speakers can benefit from a quality Toastmasters club. I would like to formally invite you to visit my club in Aurora to see what a quality Toastmasters club really is like. There’s no obligation to join. You won’t even be required to participate. Just come to enjoy the show and realize for yourself how participating as an active Toastmasters member will help you be a better speaker.